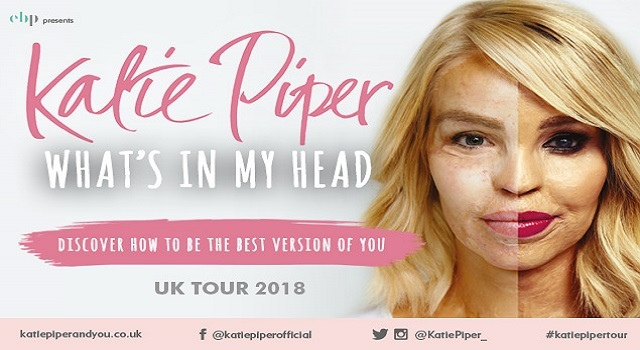 Katie Piper is opening her own diaries, photo albums and personal memories in this most intimate and revealing talk about her life. "Discover how to be the best version of you"
In a time of glossy magazines, Photoshop, Instagram filters and app dating remaining in touch with reality has never been harder. Katie embarks on her debut theatre tour to share what she has learnt and what helped her remain positive even through the toughest of times. She will discuss her own battles with anxiety andexplains how she has overcome its crippling clutches. Katie is opening her own diaries, photo albums and personal memories in this most intimate and revealing talk about her life. Insecurities exist in us all and adversity in life is unavoidable, but how can it be managed? How can we find the light in the darkest of times? Katie believes no matter how big or small your challenges might seem, there is always a confident way forward and she will show you how. This is her story, this is her life, this is her wisdom. This is ‘What’s in My Head’. At least £10 of your ticket price will go direct to The Katie Piper Foundation. will be donated to Katie’s charity ‘The Katie Piper Foundation’.